50s Western Scores By Paul Dunlap And Bert Shefter. | 50 Westerns From The 50s. 50s Western Scores By Paul Dunlap And Bert Shefter. 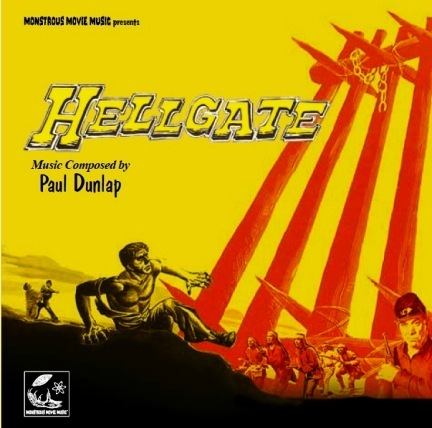 I’m really happy to have been involved, even to a tiny extent, with the CD release of a couple of 50s Western scores — Paul Dunlap’s score for Hellgate (1952) and Bert Shefter’s music for The Tall Texan (1953) — from David Schecter’s label Monstrous Movie Music. Both are Lippert pictures, available on DVD from Kit Parker and VCI. Over the course of his career, Paul Dunlap scored over a hundred films, mostly B movies of various sorts — from I was A Teenage Werewolf (1957) to Shock Corridor (1963). There were lots of Westerns: Jack Slade (1953), Stranger On Horseback (1955), The Quiet Gun (1956) and Oregon Trail (1959), to name just a few. While Dunlap wasn’t a big fan of some of the films he worked on, his name’s on some films I love. Every seen Big House U.S.A. or Shack Out On 101 (both 1955)? Hellgate is an excellent film, a low-budget reworking of John Ford’s Prisoner Of Shark Island (1936). Sterling Hayden, Ward Bond, Joan Leslie and James Arness are directed by Charles Marquis Warren. It’s obvious Dunlap liked this film, and he came through with a terrific score. The CD presents the music in sequence, cue by cue, from a set of original acetates (a few cues have been lost to time). Dunlap’s score for The Lost Continent, a 1951 sci-fi picture starring Cesar Romero, is also included. Bert Shefter was a Russian-born concert pianist and conductor. He scored his first film in 1950 and by the time he retired, had more than 60 movies and hundreds and hundreds of TV shows to his credit. His scores include Cattle Empire (1958), Return Of The Fly (1959) and Faster, Pussycat! Kill! Kill! (1965). His work on It! The Terror From Beyond Space (1958) really knocked me out. Like Dunlap, Shefter never coasted, never give less than 100% — even if if the picture didn’t really deserve it. I really like these films, and it’s easy to recommend these CDs. Monstrous Movie Music has assembled a nice package, with thorough notes and some fascinating archival material. David Schecter says that if these titles do well, there are other 50s Western scores he’d like to get around to. Let’s help make sure he can. I know and very much like Paul Dunlap, especially his scores for Samuel Fuller, who he started with (The Baron of Arizona). That film, and the other early ones The Steel Helmet and Park Row have wonderful contributions from Dunlap, and it’s perhaps even more true when Dunlap reunited with Fuller in the 60s for Shock Corridor and The Naked Kiss, the first with an especially creative score, both absolutely first-rate. Dunlap’s work on Stranger On Horseback really impressed me. And as I included in my post, he gave It! The Terror From Beyond Space a really good, moody score that really helps propel that little movie. Oh, that score’s (It!) available from Montrous Movie Music. Thanks so much for the wonderful write-up, and it’s so rewarding to see comments posted as well about these amazingly talented composers. Paul Dunlap was a dear friend of mine for 15 years, and I’m happy I was able to finally get some of his music out into the marketplace. lf HELLGATE sells well, there will be more Dunlap, as I have the original recordings of quite a few of the scores mentioned about. Paul Dunlap loved the work he did for Fuller. 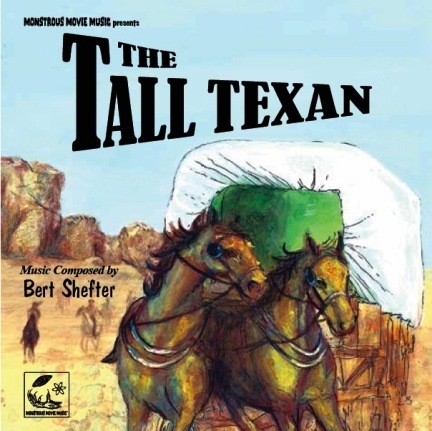 Bert Shefter wrote IT! THE TERROR along with partner Paul Sawtell. We just released a score by the pair called VIRGIN SACRIFICE, which is fabulous and very different from their sci-fi/horror scores (IT!, COSMIC MAN, LAST MAN ON EARTH, KRONOS, etc.) — all available from MMM! (sorry for the shameless plug…). VIRGIN is a very atmospheric and melody score resembling some of the superb work Sawtell did in the 1950s and 1950s for RKO’s Tarzan movies. Sound samples are out our site — http://www.mmmrecordings.com — even if you don’t want to purchase the disc. The music is fun enough just to enjoy on the web! As was so nicely mentioned in the blog post, if these westerns do well, I definitely want to do more. After so many monster scores, it’s great getting to listen to melodies and other styles of film music! Not that I don’t love the horror/sci-fi scores, but the wild west and its music offers new and different joys. And when I have to sit at a convention for 8 hours a day, some beautiful melodies help cancel out some of the bombast caused by all the foot traffic. Paul’s love theme for HELLGATE is one of the prettiest motifs I’ve ever heard, and it’s the main reason I wanted to contact actress Joan Leslie when I was researching this project. Because it was her wonderful performance that inspired Paul to compose such a gorgeous piece of music.